PTZOptics Live Video BlogFree Guide To Corporate Communications: Download Now! 0 Comment November 21, 2017 Like? Video conferencing for corporate communications are so powerful because it allows users to meet face to face all around the world. Mobility is on the rise and companies are looking for new ways to hold virtual meetings without compromising on quality or security. Designed with a wide variety of professional conferencing setups in mind, PTZOptics USB 3.0, HDMI and HD-SDI cameras are ideal choices for companies looking for highest quality video communication equipment. PTZOptics cameras work with virtually any meeting software including GoToMeeting, Skype, Vidyo, WebEX and more. Compared to a USB 2.0 webcam, you will notice the incredible quality available inside your favorite meeting software when used with a USB 3.0 camera. The included IR remote control and camera IP control ports provide maximum flexibility, and it’s intuitive for in-room users, remote participants on the far end of your video call and even IT support members across your network from any computer. Made with flexible mounting options from wall, ceiling or pole mounts, your organization can discreetly capture ideal angles for professional video production. These options combined with high quality optical lenses to optimize the video in most lighting scenarios, PTZOptics cameras provide the high quality optics with best in class pan, tilt and zoom motors. With only a few cameras, your video team will have multiple options to produce high quality content for your corporate video communications. Let’s not forget about corporate event spaces, either. PTZOptics cameras are used for broadcasting in HD quality around the world.Broadcasting corporate events, shareholder meetings and new product launches are an effective way to deliver your organization’s message to the people that matter all around the world. PTZOptics — Broadcast Quality Made Affordable. Download our free Ultimate Guide to Corporate Streaming at the link below. 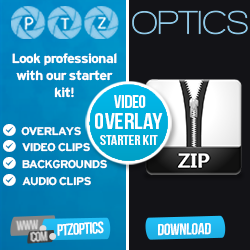 Or visit our website at www.PTZOptics.com to learn more. Check out our free Ultimate Guide to Live Streaming to see exactly how it can help with office communications. PTZOptics Live Streaming Camera Manufacturer focused on HD-SDI, USB 3.0, HDMI and IP streaming cameras. More on Understanding Network Infrastructure for Live Streaming Video to Internal, External and Remote Audiences here. New Trend: Broadcasting from the Boardroom. More here. Corporate Event Streaming w/ Event Stream Live Interview here. How to livestream a corporate conference or event here. How to build an in-house video studio for live streaming here. How to design a video background in your office here. How to setup a teleprompter for your studio talent to deliver great videos here. Designing 3D models for technology spaces here. Using a Crestron Control System for complete system control here. How to sell virtual tickets to your next event here. How to calculate PTZ Camera Optical Zoom and Field of View here. How to access the On Screen Display Menu via IP web browser here.